How do you maintain women's tops? Women’s tops and blouses come in all different colors, styles, silhouettes, and fits. Some cuts are particularly flattering on lots of silhouettes. Use accessories to dress tops up or down for different occasions. 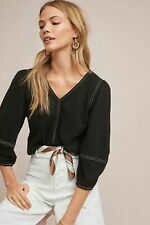 What styles of women’s blouses are there? Women’s tops and blouses come in all different designs, including off-the-shoulder, tunic, babydoll, sleeveless, and Oxford. Ribbons, embroidery, metallic accents, and graphic designs are some of the embellishments that can adorn different blouses. Patterns like floral, stripes, polka dots, and paisley also help to individualize shirts. Flattering colors that work with all skin tones, such as gemstone colors like royal blue, magenta, emerald green, and amethyst purple, can be found in your favorite cut. What silhouettes of shirts accentuate what body types? Deep v-necks, cowl necks, color-block blouses, ruched shirts, and vertical stripe patterns are universally flattering. Deep v-necks show off collarbones and accentuate necklaces. The exposed decollete helps to create a long line and emphasize facial features. Often, ruched tops utilize a deep, v-neck design and combine it with a focal point of gathered fabric for extra emphasis. Cowl necks create a soft appearance due to a panel of draped fabric at the neckline. Color blocking and vertical stripes accentuate an hourglass figure, particularly when belted at the waist. How do you care for a shirt? Care depends on which materials the shirt is made from. Dri-fit garments made from nylon, polyester, or synthetic blends can be washed in a machine on a gentle cycle and tumble dried on low. Use an iron on low heat, or simply hang your top in the bathroom while you shower so that steam erases wrinkles. Cotton or linen can be machine washed; some shirts are pre-shrunk. You may consider hanging cotton or linen to dry rather than using a dryer in order to completely avoid any more shrinking. These textiles may hold onto wrinkles more firmly than synthetic blends; you may need to use a traditional iron on a slightly higher heat setting. Shirts made from stretchy, knit material lasts the longest when folded flat instead of hanging. Cotton, ironed tops will stay wrinkle-free when hung in the closet. Seasonal items can be stored away during the off-season in a securely sealed tote to keep them free of dust. Storing clothing in a drawer with a sachet can add a lovely scent before wearing them. Repairing a button typically requires the original or replacement button, a needle, and sewing thread.